A project to popularise machinery in tea smallholdings was launched by the Ministry of Plantations recently. On a proposal of the Ministry, the Government allocated Rs.100 million for the purpose in 2013 Budget considering the serious issues the tea industry faced as a result of the acute labour shortage. Of the Rs.100 million, Rs. 67.5 million has been allocated for awareness, training and supply of machines to selected smallholder societies and factories and the balance Rs.32.5 million for research and development on harvesting machines. The Government disbursed Rs. 40 million and the Tea Research Institute (TRI) has launched a program to train tea smallholders in the use of new machinery under phase I of the program, . 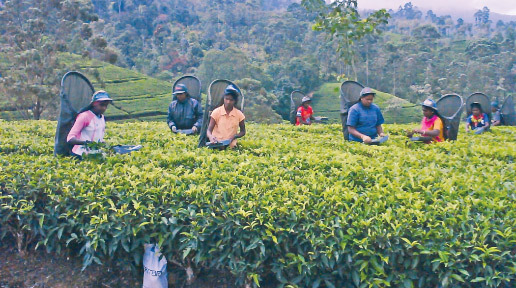 Chairman of the Tea Research Board, Dr. Gerry Jayawardena said that the investment in the tea industry would ensure the sustainability of the industry. There was a threat of collapse of the tea industry in the long run as a result of a severe labour shortage. “This issue is common in the agriculture sector today and as a former Director General of Agriculture I have experienced how mechanisation could change the situation, specially our experience in paddy farming,” he said. “We made this proposal in the 2013 Budget and we have got the money. This initiative will improve labour productivity and change the attitude of the younger generation on plantation jobs,” Dr. Jayawardena said. Senior Research Officer and the Officer-In-Charge of the TRI Low Country Regional Centre, Ratnapura, Dr. M.A. Wijeratne said that in the initial phase, 50 tea smallholder societies and 25 private tea factories have been selected for the project covering all tea growing regions. This training of trainers program is being conducted at the Ratnapura regional centre. It is a two-day residential training on the use of plucking shears and machines. Two members from each society and Tea Inspectors of the Tea Smallholding Development Authority will participate and 150 trainers will be trained initially. Training will be conducted on the use of tea plucking, pruning and holing machines. There are three machines for tea harvesting. The manually operated shears, suitable for small tea lands, can double the output. The battery-powered small machine can increase output by three times and the large petrol machine can increase output five times. A labourer can prune 250 tea bushes a day manually and with the pruning machine this will be increased to 800-1,000 bushes a day. The holing machine can increase labour productivity by over five times. Dr. Wijeratne said that the training conducted irrespective of gender and women received the training in operating all the machines. The second level training will be launched in March and is expected to create a huge impact on the tea smallholdings sector including attitude change and forming of new service providers for harvesting, pruning and holing. The TRI provides a 50 percent subsidy to tea smallholders to purchase the machines. 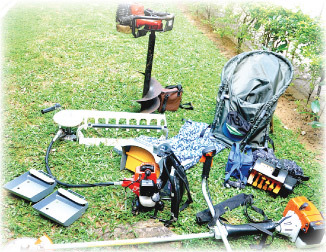 Each society will get 10 shears, 10 baskets, one motorised plucking machine, one battery operated plucking machine, one pruning machine, one holing machine, worker overalls and safety gear which cost around Rs. 350,000. 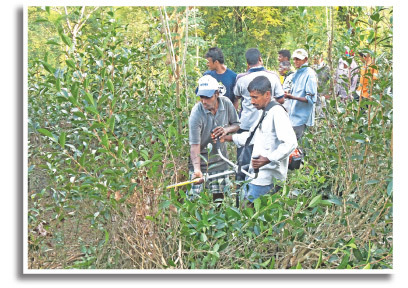 Dr. Wijeratne said that out of around 200,000 hectares of tea lands in Sri Lanka 58% are smallholdings. According to 2012 statistics the total tea production was 326 million kilos and the estimated average production was about 1,600 kilos per hectare per year. Low productivity, high cost of production and declining quality are the key issues faced by the tea industry today. These issues are greatly related to lack of labour, high cost of input and lack of mechanisation of labour intensive cultivation practices such as plucking and pruning. Plucking (harvesting of tea) is considered to be the most labour intensive field operation in tea cultivation. More than 70 percent of the workforce in a plantation is employed daily for plucking while about 35-40 percent of the total cost of production comprises cost of harvesting. More importantly, plucking policies influence growth, yield and quality of the end product. Due to lack of workers, some tea estates are either harvested at extended plucking rounds leading to loss of crop and quality or are permanently abandoned leading to heavy crop losses to estates. Extended rounds can reduce tea crop by more than 20 percent. Due to the nature of plucking operations in the field and due to fatigue, young workers keep away from estate work. The quality of the end product is affected when the harvested crop comprises of more coarse leaves (mature shoots) due to delayed harvesting. Being a major tea growing country with more than 95 percent of production exported securing a premium prices in the world market, it is extremely necessary to produce top quality tea, he said. A majority of the tea produced come from tea smallholdings, estimated to be around 400,000. Although, it is expected that harvesting of smallholdings is carried out by family labour, many use hired labour, some of whom come from nearby estates. This also has been identified as one of the causes for absenteeism of workers in corporate sector tea estates. In addition, corporate sector estates also face problems in finding labour for their field practices. Therefore, mechanisation of plucking has been identified as an urgent need for ensuring sustainability of the tea industry, he said. Dr. Wijeratne said that there is a rapid increase in mechanisation of tea cultivation in the corporate sector. Mechanised tea harvesting was initially implemented at Gawaravila Estate, Hatton and at Alton Eastate in Talawakele and thereafter, in many other plantation companies. Today Grayton Estate, Kotagala has fully mechanised tea harvesting. Evidence clearly demonstrates that mechanisation contributes greatly to increase productivity and the quality of tea, he said. Project activities and the training of trainer program is led by Dr. Wijeratne and coordinated by the Officer-in-Charge, TRI Deniyaya centre, Saman Ratnayake.